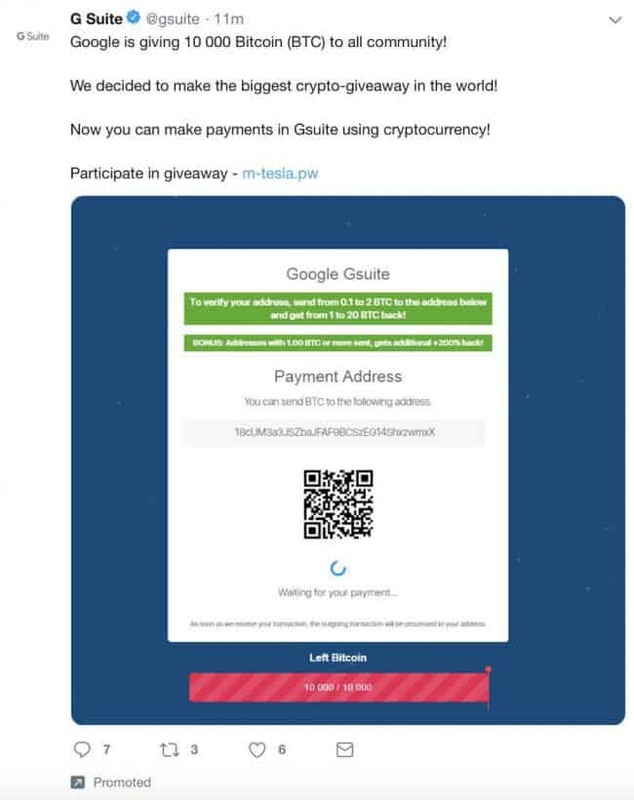 Google’s official G Suite Twitter account has become the latest victim in a string of ongoing cryptocurrency related hackings on the social media platform aimed at promoting an elaborate Bitcoin scam. The tech giant now joins a list that includes such heavyweights as Target, Elon Musk, and India’s National Disaster Management Authority, via The Next Web. The ruse — which has scammers hijack verified Twitter accounts in order to send out fake, promoted tweets from respectable sources — flooded Twitter timelines, directing users toward a Bitcoin link scam as part of a “giveaway.” In addition to this, the scammers also used high profile accounts to champion the malicious link, in an effort to boost credibility. Twitter released a statement to The Next Web regarding the Target hack, “We’ve been in close contact with Target this morning and can also confirm that their account was inappropriately accessed for approximately half an hour, after which we swiftly locked the account so Twitter could thoroughly investigate the issue.” However, with the sudden Google G Suite hack shortly after, Twitter has a great deal of questions regarding their promoted content protocols, and review system.